The VTX B18 is JBL Professional’s next-generation single 18” subwoofer, designed to complement VTX full-range sound reinforcement systems. The VTX B18 features JBL’s new 2288H 18” woofer, engineered for improved linearity, increased sensitivity and extra-long excursion. The 2288H is based on JBL’s Differential Drive, dual voice coil, dual-gap technology, which delivers better heat dissipation, lower power compression and wider dynamic range than conventional single-coil designs. The B18 incorporates JBL’s patented Slip Stream™ double-flared exponential low-frequency port design to improve airflow and reduce audible turbulence, even at maximum excursion. 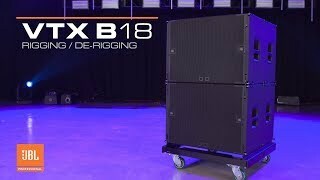 The B18 shares the industrial design of the JBL’s VTX A-Series products and has the same width and suspension hardware as the VTX A8, allowing the two products to be used together in a variety of flown or ground-stacked configurations. The VTX B18 can be deployed in omni-directional or cardioid configurations, in arrays of up to 16 enclosures.